Vladimir Jabotinsky is well remembered as a militant leader and father of the right-wing Revisionist Zionist movement, but he was also a Russian-Jewish intellectual, talented fiction writer, journalist, playwright, and translator of poetry into Russian and Hebrew. His autobiography, Sippur yamai, Story of My Life-written in Hebrew and published in Tel Aviv in 1936-gives a more nuanced picture of Jabotinsky than his popular image, but it was never published in English. 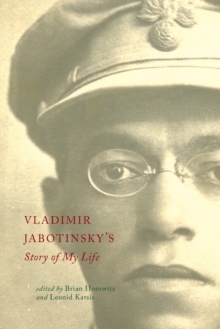 In Vladimir Jabotinsky's Story of My Life, editors Brian Horowitz and Leonid Katsis present this much-needed translation for the first time, based on a rough draft of an English version that was discovered in Jabotinsky's archive at the Jabotinsky Institute in Tel Aviv. Jabotinsky's volume mixes true events with myth as he offers a portrait of himself from his birth in 1880 until just after the outbreak of World War I. He describes his personal development during childhood and early adult years in Odessa, Rome, St.
Petersburg, Vienna, and Istanbul, during Russia's Silver Age, a period known for spiritual searching, but also political violence, radicalism, and pogroms. He tells of his escape to Rome as a youth, his return to Odessa, and his eventual adoption of Zionism. He also depicts struggles with rivals and colleagues in both politics and journalism. The editors introduce the full text of the autobiography by discussing Jabotinsky's life, legacy, and writings in depth. As Jabotinsky is gaining a reputation for the quality of his fictional and semi-fictional writing in the field of Israel studies, this autobiography will help reading groups and students of Zionism, Jewish history, and political studies to gain a more complete picture of this famous leader.